The peace movement is alive and well in Latino communities across the nation, as well as in Puerto Rico. On Aug. 29, Latino-led press conferences in San Diego, Los Angeles, San Francisco, Chicago and El Paso announced a national effort “to demilitarize our public schools and community colleges,” in the words of Fernando Suarez de Solar, spokesperson for the effort. Suarez del Solar, who attended the San Diego event, announced the formation of a new group, Latinos Opt-out of Military Recruitment. Simultaneously, in San Juan, Puerto Rico, the Citizens’ Coalition Against Militarism announced that it will join in the opt-out campaign. Puerto Rico’s youth have been heavily targeted by U.S. military recruiters. 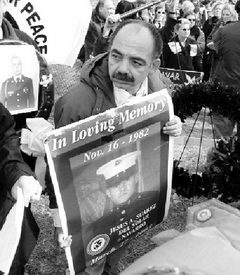 Suarez del Solar is the father of Jesus Suarez del Solar, who was one of the first U.S. Marines killed in the spring 2003 invasion of Iraq. Since then, Fernando has been traveling throughout the nation speaking against the war and mobilizing Latino military families to oppose the war. Now he has helped launch a major counter-recruitment drive aimed at educating and motivating students and parents to stop public schools from releasing students’ personal contact information to military recruiters. This national Latino counter-recruitment effort has been joined by a newly formed Latinos For Peace group. It has launched an open letter/petition drive nationwide in which Latinos are signing on to call for “U.S. Out of Iraq! Bring Our Troops Home Now.” Some 1,500 Latinos from 20 states and Puerto Rico put their names on the open letter in the first two weeks of the petition campaign. The opt-out campaign chose Aug. 29 as the kickoff day to coincide with the 35th anniversary of the Chicano Moratorium against the Vietnam War in 1970, when 30,000 Latinos and progressive supporters marched through the barrios of East Los Angeles opposing that war and the high rate of Latino casualties. The opt-out issue stems from the Bush administration’s “No Child Left Behind” education funding program that requires schools to give the military information on their students or face loss of federal funds. To avoid this breach of privacy parents have to formally tell the schools not to release the information on their children to the military. Parents and peace activists have joined in a national opt-out movement, and in many areas the movement is strong. In a Montclair, N.J., school district, 92 percent of the parents have asked the schools not give the information to the military. “We need to do the same kind of thing in the barrios,” said Muñoz. Suarez de Solar says the next step is to have early morning peace vigils at barrio high schools giving information about “opting out” to the students. After the press conferences in San Diego and Chicago, volunteer activists in each city gave out 1,500 information sheets about opting out to parents in Latino neighborhoods to begin the outreach.